Tweet here from Climate Denier Joe Bastardi seeks to mislead, confuse, as usual. Bastardi’s predictions of 6 and 7 years ago of an impending cold period have yet to be realized. Apparently this is his effort to seem relevant. He was taken to task by climate scientist and twitter boss Zack Labe. It snowed in the Sahara. That is enough to support the idea the world is not going to become an oven anytime soon. Lets just ignore the STAR data which shows cooling for decades. “It snowed in the Sahara. That is enough to support the idea the world is not going to become an oven anytime soon”. Another contender for a place on the list of the “Ten Dumbest Things Bates Has Said”. Hmmmmm. On second thought, Bates has said so many dumb things that maybe we need to expand the list to 25? or 50? Giss temperatures which are per a statistical study last year 66 percent fake. Snow in the Sarah is consistent with a moistening atmosphere, as is the surface mass change on the Greenland ice sheet. And what cooling are you talking about in the STAR data? It snowed 37 years ago in the Sahara as well. All you are looking at is an uncommon weather pattern which pushes freezing air south and slightly less freezing air north. You’ve thoroughly debunked all scientists who postulated the world becoming an oven soon. You haven’t addressed the world becoming a washing machine. When did you folks lose all ideas of what science is all abou?. You make a headline about how your favorite boogeyman of the week is so bad and than a paragraph or so down say weather variability does not make climate yet you use the weather to attack the guy on the current ice conditions in Greenland. WHAT? (Bates is approaching Omnologos in his level of incoherence). it’s fine. He can’t do any damage here. Safe space for him. “It is too late to employ medicine when the evil has grown strong by inveterate habit.” If you had taken that to heart you wouldn’t have the Trump mess now. These things must be nipped in the bud. Thanks, CAC, I was wondering why for most years there was more precipitation than loss over a year. Your link shows why. Just a quick notice from your link. It’s only been about 8 -11 Gt of CO2 per year increase to effect a change of about 3000 Gt in Greenlands Ice sheet in the last 10 years. If there was anything at all to the deniers story the ice sheet would not be in long term and increasingly rapid decline. Some people seem to have a need to push “it” up hill. How to Bastardise weather and climate reporting. Hey Joe, there are more than two sides to this but you miss most of them. Oh, and your tweets are irritating from your mangling of language. Interesting article about loss of Antarctic sea ice – record low ever recorded. Some cherry picked quotes: “There is about 10 per cent less sea ice in Antarctica this year than the previous record minimum – a stunning reversal after new highs were set in 2014. The sea ice extent around the southern continent has shrunk to 2.1 million square kilometres on Tuesday, Jan Lieser, a sea ice scientist at the Hobart-based Antarctic Climate and Ecosystems Co-operative Research Centre, said. The switch from a sea-ice maximum around Antarctica to its annual low is “one of the biggest natural cycles we see in the world”, with as much as 90 per cent of the ice only a year old at the most. In the southern winter of 2014, sea ice around Antarctica reached a record large extent. At the time, climate change sceptics were keen to highlight the increase in the south as a counterpoint to the more steadily decreasing Arctic ice. Last winter, though, ice around Antarctica began thawing about a month earlier than normal. 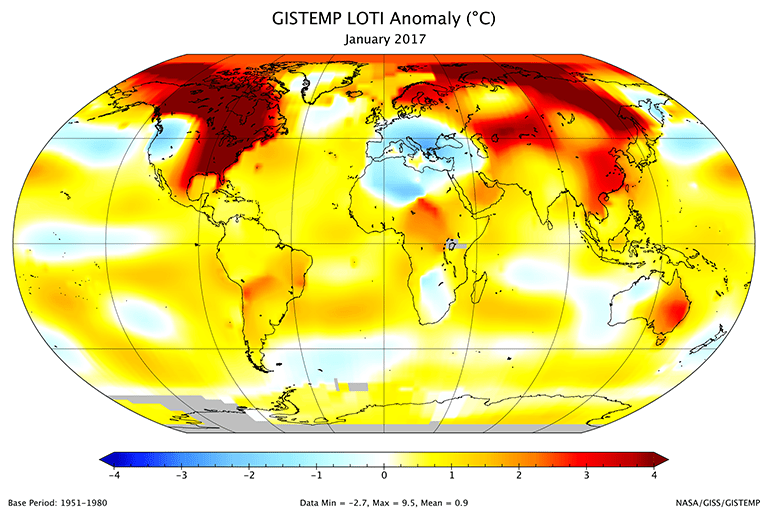 Minimum air temperatures have been breaking records daily since about early November in a region of the planet where global warming has been amongst the most rapid, Dr Lieser said. The Ross Sea is virtually ice free and half the Weddell Sea ice has gone, Dr Lieser said.